Rhinoplasty is an operation designed to change the appearance and improve the function of your nose. There are several components to your nasal shape that you may wish altered in some way. These include the profile from the side view, the length or width, or the shape of the tip and the nostril openings. The most common concerns include a “bump” of the nose, a crooked nose or a bulbous nose tip. Breathing difficulties may be an issue, particularly following previous fracture of the nose (broken nose). We offer digital imaging technology to edit your pictures in order to demonstrate your expected result following nose surgery. The changes you wish to achieve may require altering the bones and cartilages that make up the skeleton of the nose. The lining of the nasal passageways or even the skin covering may also be changed. It is important to be clear about the changes you want and to agree with your surgeon on realistic goals before surgery. When assessing your nose, the balance of your facial features will also be assessed and discussed with you. It is not uncommon for the chin projection to be mentioned as a weak chin may make the nose appear large for your face. In this situation, chin augmentation may be discussed with you. The profile of the nose can be altered to give a straight appearance or a softer “retruse” appearance with relative tip projection. These options will be discussed and clarified with you at the time of consultation. 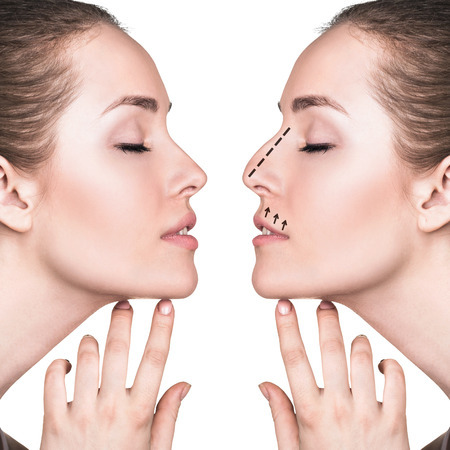 There are two main approaches to rhinoplasty. Firstly a closed approach is done through the nostrils with no external stitches. Secondly, an “open” approach is done via a small incision under the base of the nose. This gives better access to work on the skeleton of the nose an may be preferred when more complicated work is required. The operation is performed under general anaesthetic and generally takes about two hours. Usually rhinoplasty involves an overnight stay in hospital. It is possible for the surgery to be done on a day surgery basis if you wish. The surgery may be associated with some discomfort but is usually surprisingly pain free. Pain relief will be prescribed as necessary. Following the operation, you will have a small splint over the nose for protection. This should stay in place for about one week. Usually, small strip bandages are placed into the nostrils to prevent bleeding. These should not cause undue discomfort and will be removed the morning following surgery. Your nose will feel strange, somewhat tight and swollen for several days and a degree of swelling and bruising, particularly around the eyes and cheeks, will probably be encountered. Although most of the swelling subsides in one to two weeks, there continues to be some swelling that may take six months or longer to subside. Swelling inside the nose can persist for several weeks and cause nasal stuffiness. Generally speaking you will be confident and happy to engage in social contact by the second week following surgery. It is important for you not to over-exert during the healing period or troublesome bleeding may occasionally occur and require repacking of the nose. Return to work at 2 weeks is usual. As with any surgical procedure, there is a small risk of complications. Surgery and anesthesia are very safe and it is most unlikely you will experience any difficulty. However, there are areas of potential problems you need to understand before proceeding with your surgery. Bleeding and infection are very uncommon with nasal surgery. This is due to the superior blood supply and healing qualities of the nasal tissues. Incisions or cuts used to perform the surgery are designed to be hidden in such a way that nobody should notice that you have had surgery. The incisions can be either completely internal or may involve a small cut through the base of the nose. Scarring following surgery can take up to 2 years to mature and can generally be expected to be minimal and unnoticeable. However, while great care will be taken to give the neatest incision closure possible, the healing process can be unpredictable and it is possible, although unlikely, that you may be unhappy with some aspect of your incision lines or the shape of your nose. Swelling of the nose can affect nasal contour for some months and during this period of settling, improvement in nasal shape can be expected. It is likely that close scrutiny of your new nasal shape may reveal some small irregularity in contour or symmetry. Having expectations of improvement with a change of shape rather than perfection is the most likely result in post-operative satisfaction. The nose is part of the airway by which air enters the body during breathing. By manipulating the nose shape it is possible the nasal air passageway can be altered. You may notice nasal congestion and some restriction to airflow through the nose, particularly in the early post-operative months. This can be expected to resolve as swelling settles. You may also temporarily experience a diminished sense of smell. The tip of the nose often feels numb for some months but this is quite normal and usually recovers completely. In the first few weeks, there may be a feeling of stiffness or numbness in the upper lip. This is because swelling in the nose can affect the movement of the lip. As with all other changes due to this swelling process, it is quite transient. The lip or a front tooth may be numb temporarily. You will be receiving a general anesthetic and your anesthetist will be discussing with you possible discomforts following anesthesia. Anaesthesia today is very safe and the chance of any problem is very low. Any questions you have regarding your anesthetic would be best answered by your anesthetist at the time of surgery. Emotional stability is the primary factor to be considered before any aesthetic surgery is performed. A “new nose” does not guarantee a new life or an end to existing personal problems. A positive mental attitude of the patient is very important to a successful outcome being achieved. Rhinoplasty can improve your appearance and renew your self-confidence; the rest is entirely up to you. Costs of surgery will always differ from surgeon to surgeon. There is a range from “cheap and nasty” to ridiculously overpriced in the market place. Do your homework and be happy with the quality of service and experience you are being offered. Beware of the pitfalls of shopping around for the cheapest costs for this operation as this is the wrong way to choose your surgeon and may leads to disappointment with results. Remember surgery is not like purchasing a TV or a computer. The product is not a commodity and what you get will differ depending on who you choose to perform your surgery. Dr Drielsma offers a good value price structure for breast lifting but his patients choose him on reputation and results, not the cheapest price. It is important to remember that healing continues for some time following surgery as the skin shrinks and adjusts to the new framework. Rarely, the final result may not be what you and Dr Drielsma anticipated. Minor irregularities usually can be corrected with a revision procedure. The quality of skin overlying the nasal cartilage is an important factor in the final appearance of the nose. Thick and oily skin does not conform as well and may compromise the result. Older skin does not possess the elastic properties of younger skin and may preclude an optimal result. You should avoid smoking for at least three weeks before and after surgery to assist in the healing process. You should also not take aspirin or aspirin-containing medications for two weeks prior to surgery. Should there be any questions regarding rhinoplasty, be sure they are answered in advance by Dr. Drielsma. Well-meaning friends are not a good source of information. Find out everything before proceeding with the operation – a well-informed patient is a happy one. Finally, there can be no absolute guarantee with any surgery. Remember, the realistic aim of this operation is an improvement, not perfection.